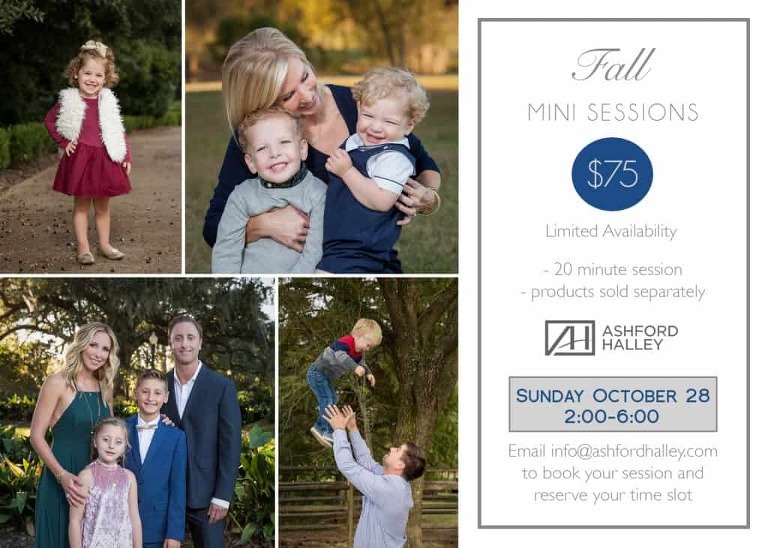 Back by popular demand and just in time for Christmas, Ashford Halley Family Fall Mini Sessions are here! And, we are offering our past clients first priority on booking these mini sessions. For those who aren’t familiar, our family mini sessions are a great opportunity to update your family portraits and decorate your walls! All sessions will be done on October 28th from 2pm – 6pm. For only $75 plus local sales tax you’ll get a 20 minute portrait session at Capital Park. There is no limit on the number of people you can include in your session! As long as it fits in the 20 minutes included in your session then you’re good to go! We’ll be providing Fall Family Mini Sessions for the Baton Rouge area! Contact us for more details at info@ashfordhalley.com or our website www.ashfordhalley.com. © 2019 Ashford Halley | New Orleans Wedding Photographer|ProPhoto6 Blog|Design by Northfolk & Co.